A skeptic would find it interesting that many of the players involved in misleading the public about the dangers of tobacco smoke have been recruited by the anti-AGW camp (Dr. Richard Lindzen being one of them). They would also find the leaked API Global Climate Science Communications plan ( http://www.euronet.nl/users/e_wesker/ew@shell/API-prop.html ) an interesting read, showing the planning that was going on in the fossil fuel industry to mislead the public about the science of climate change. The skeptic would also find it interesting that about $900 million a year is now being spent to mislead the public about climate science ( http://drexel.edu/~/media/Files/now/pdfs/Institutionalizing%20Delay%20-%20Climatic%20Change.ashx ). It would also be interesting to note that where funding for right-wing think tanks and astroturfed climate denial front groups was made openly in the past ( http://www.theguardian.com/environment/2009/jul/01/exxon-mobil-climate-change-sceptics-funding ), the funding is now done largely through groups like the Donor’s Trust to hide the trail ( http://www.desmogblog.com/who-donors-trust ) . Climate change denial is a denial or dismissal of the scientific consensus on the extent of global warming, its significance, or its connection to human behavior, especially for commercial or ideological reasons. Typically, these attempts take the rhetorical form of legitimate scientific debate, while not adhering to the actual principles of that debate. Climate change denial has been associated with the fossil fuels lobby, the Koch brothers, industry advocates and free market think tanks, often in the United States. Some commentators describe climate change denial as a particular form of denialism. Although there is a scientific consensus that humans are warming the climate system, the politics of global warming combined with some of the debate in popular media has slowed global efforts at preventing future global warming as well as preparing for warming “in the pipeline” due to past emissions. Much of this debate focuses on the economics of global warming. Between 2002 and 2010, nearly $120 million (£77 million) was anonymously donated, some by conservative billionaires, via two trusts (Donors Trust and Donors Capital Fund) to more than 100 organizations seeking to cast doubt on the science behind climate change. Are there any advocates of climate science denial who don’t take money from fossil fuel companies? Earlier this year, the New York Times exposed the secret relationships between a well known climate change denier and the fossil fuel industry. The Times revealed that Dr.Willie Soon had been paid over 1.6 million dollars to create scientifically dubious studies absolving the fossil fuel industry of any responsibility for climate change. His funders included ExxonMobil, the Koch brothers, and Southern Company, a large coal-fired utility. ‘An overwhelming majority of the American public, including half of Republicans, support government action to curb global warming, according to a poll conducted by The New York Times, Stanford University and the nonpartisan environmental research group Resources for the Future. There are also some books such as “Don’t even think about it” (http://www.climateconviction.org/ )and projects such as the Yale project on climate change communication: http://environment.yale.edu/climate-communication/ that explore the psychology and sociology of climate change. 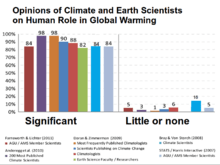 This is a list of scientists who have made statements that conflict with the mainstream scientific understanding of global warming as summarized by the Intergovernmental Panel on Climate Change and endorsed by other scientific bodies. “There is new and stronger evidence that most of the warming observed over the last 50 years is attributable to human activities“, in particular emissions of the greenhouse gases carbon dioxide and methane. There have been several efforts to compile lists of dissenting scientists, including a 2008 US senate minority report, the Oregon Petition, and a 2007 list by the Heartland Institute, all three of which have been criticized on a number of grounds. Each scientist listed here has published at least one peer-reviewed article in the broad field of natural sciences, although not necessarily in a field relevant to climatology. [B] Since the publication of the IPCC Third Assessment Report, each has made a clear statement in his or her own words (as opposed to the name being found on a petition, etc.) disagreeing with one or more of the report’s three main conclusions. Their views on climate change are usually described in more detail in their biographical articles. As of August 2012, fewer than 10 of the statements in the references for this list are part of the peer-reviewed scientific literature. The rest are statements from other sources such as interviews, opinion pieces, online essays and presentations. This entry was posted in culture, Γαῖα, wikipedia and tagged acid rain, climate change, Climate change denial, David Michael, environmental science, Erik Conway, ExxonMobil, global warming, government, merchants of doubt, Michael Mann, Naomi Oreskes, NASA, New York Times, oil, political corruption, political ideology, propaganda, public opinion polls, Republicans, scientific community, Ted Cruz, the Koch brothers, United States. Bookmark the permalink.